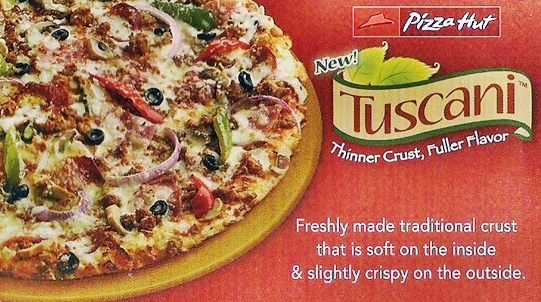 The new Pizza Hut Tuscani with five exciting flavors are now available at Pizza Hut in KCC Mall of Gensan. And yesterday October 26, 2011, members of the Soccsksargen Bloggers were invited to a taste test of - Pizza Hut Tuscani Supremo, Pizza Hut Tuscani Premium All Meat, Pizza Hut Tuscani Gourmet BBQ Chicken, Pizza Hut Tuscani 3- Cheese Bacon and Spinach and the Pizza Hut Tuscani Roast Beef. Thank you to Mr. Jasper Barraca, the restaurant general manager of Pizza Hut KCC Mall of Gensan for the pizza overload. The only Pizza Hut in Soccsksargen is located at the 2nd Floor of KCC Mall of Gensan. Visit them now!